Make this cute crocheted bunny your next weekend project. Its cute and charming looks will make it an instant favorite among kids and kids at heart. In fact, this pattern is an ideal project for confident beginners and intermediate crocheters who are on the lookout for fun and awesome crochet articles to add to their collection. 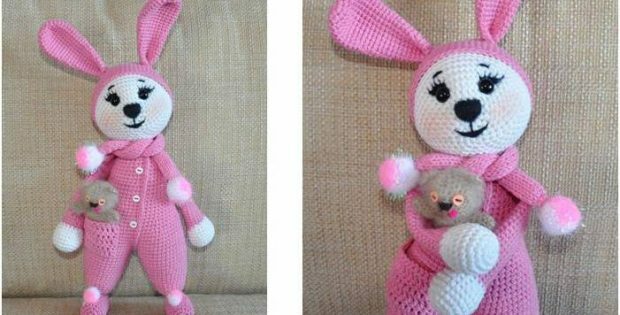 Once finished, the crocheted toy bunny should measure approximately 12 inches in height. In metric measurements, the completed Amigurumi bunny should be about 30 cm tall. This cute and cuddly Amigurumi bunny in pajamas is another wonderful creation by the talented design team over at Amigurumi Today. In fact, you can access the FREE pattern for this cute and charming crocheted bunny from their website. To access the FREE pattern for this lovely crocheted toy, please click on this link: Amigurumi Bunny In Pajamas Pattern.